In 2001 Apple was still at the beginning of its slow transition from the Mac OS 9 era into the X one and also building up what would become a prominent role in the desktop video market. In may of that year a promotional video was released in which Steve Jobs showed off the first Apple Store: in the last part the camera pans on the aisles and we can take a look at the main software offerings from Apple, still a mix of classic product lines and solutions coming from the NeXT acquisition. 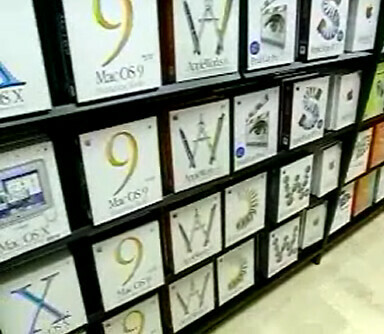 From left to right you can see boxes of Mac OS X 10.0, Mac OS 9, AppleWorks 6, Final Cut (Pro) 1.2.5, AppleShare IP, AppleCare while in the lower part are Apple Media (blank) CDs and WebObjects 5.